Who says that humans are the only ones capable of following the rules? Definitely not this flock of well-disciplined geese that you’re about to see on the video clip below. While crossing the street, these birds seem to have perfected the art of discipline and conformity. You’ll be amazing as you watch this group of geese act like perfectly behaved pedestrians as they cross the street. If there’s one thing these feathered creatures can teach us, it’s pure discipline. They just proved to us that animals can also be good citizens, and even better than most people these days. 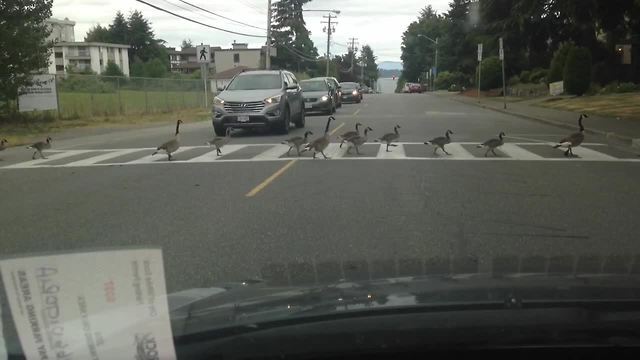 Not only did they form a line while crossing the road, they also did it while using the crosswalk. Pretty unbelievable, huh? Don’t forget to share if you know someone who needs a lesson in learning how to cross the road properly! Even geese know enough not to j-walk.